The Bachelor of Arts in Music degree is a non-professional degree designed for talented musicians who wish to pursue a broad liberal arts education. Curriculum flexibility affords students the opportunity for a variety of pre-professional studies, including premedical and pre-legal. A minor outside the Frost School of Music is required. Students in the BA in Music program must earn a minimum 2.5 GPA each semester to remain in the program. 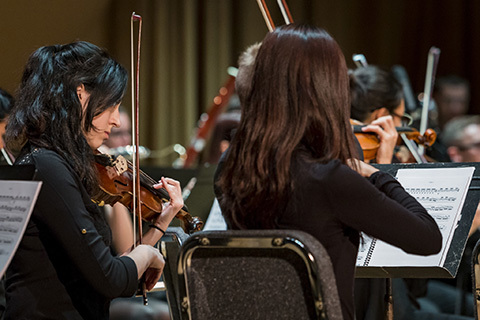 The mission of the Bachelor of Arts in Music is to provide students with the highest quality education possible in music, a broad education in the liberal arts, and in-depth study in an academic area outside of the Frost School of Music. Students will acquire a thorough knowledge of music theory and music history, and develop advanced competence in musical performance. They will develop the ability to think, speak, and write clearly with the capacity to explain and defend their views effectively and rationally based on substantive knowledge of the liberal arts. The student will acquire competency in a selected non-music academic area that includes a broad understanding of the area and contemporary thought within the area.